Welcome to the Abnegation Faction! Those who blamed the war on selfishness made Abnegation. Welcome to our faction. Always look to others to see how you can help them. Everything about the Abnegation faction is meant to help you forget yourself and protect you from vanity. If we have little, and want for little, and we are all equal, we envy no one. As we work well together and are peaceful, very few people who are born into Abnegation choose to leave it. When they do, we remember. No staring at yourself or others. You may only see your reflection once every three months while getting your hair cut. Sit quietly in public. You may laugh and joke once you get home. Sarcasm is not acceptable as it is always at someone else's expense. Curiosity is rude, don't ask questions. Do not lust for power as it leads men into dark and empty places. Each member of the family must take rotating turns cooking the meals and cleaning up. Children may not speak at the dinner table unless they are addressed directly. After dinner, the family will gather in the family room where the children can talk. The Abnegation faction only eats frozen or canned food because the farms are far away. The only meal option we have is genetically engineered produce. The Abnegation hairstyle and clothing is meant to help protect you from vanity. Clothing: Gray shirts, robes and slacks. The only adornment allowed is a practical watch. Hairstyle: Very plain, nothing fancy. Every home is the same size and rectangular shape. Each is made of gray cement and has few windows. The mailboxes are a dull metal and the lawns are all crab grass. Abnegation has fulfilled our need for selfless leaders in government. You can also volunteer to help make our city a greater place to live for all. The Erudite faction has been attacking us by creating antagonistic reports for months now. The main character from the book Divergent, Beatrice Prior, and her mother, father and brother (Caleb) are all from Abnegation. Other well-known characters are Susan, her brother (Robert), Marcus and Tobias. 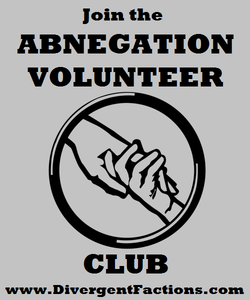 The Abnegation Volunteer Club has been created by fans of the Divergent series in order to promote the ultimate acts of Selflessness such as community services and donating to charitable causes. We help those than cannot help themselves. Want to join us? Click the poster on the left of the link below to see more information about the Abnegation Volunteer Club such as our list of goals and how to join and pledge to help others in your community.